Processing Thermal or Photopolymer computer-to-plate media requires a very high pH developer. Many municipalities discourage high-pH effluents and recognize neutralization as an acceptable approach to meeting the local sewer requirements. 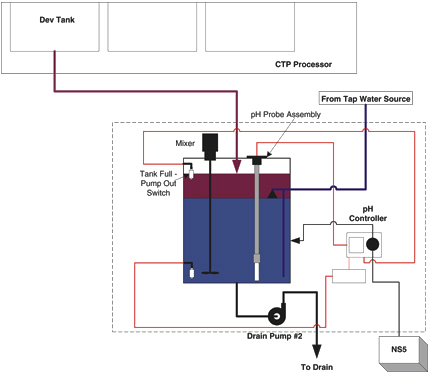 The PropH-T/P automated neutralization system from PriscoTech is designed to collect thermal and photopolymer CTP developer effluent, automatically monitor the pH and, when needed, dose the required neutralizer until the effluent meets the user determined pH. When the pH set-point is reached, the drain pump will initiate, pumping neutralized effluent to the drain. 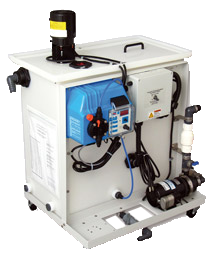 Simply connect the PropH-T/P to the processor developer drain and overflow, water supply and building drain or waste container. Connect the neutralizing solution suction line to the cube and dosing pump inlet and then plug it into a standard wall outlet. The PropH-T/P is ready to collect waste developer. When the water supply is turned on, water will fill the PropH-T/P tank until the float valve closes. Developer overflows in the processor and down the drain into the PropH-T/P tank. When the pH raises, the dosing pump actuates and adds neutralizer until the set-point is reached. When the tank is full, the high-level float switch actuates and if the pH is within the acceptable range, it will pump to drain and a flush sequence starts. For Connection to Large Developer tanks or Multiple Processors use the optional Metering/Collection Tank. The PropH-T/P is designed for Agfa, Kodak, and Fuji Thermal photopolymer plates. If you have other plates, contact your Prisco representative for information on other models.